A matching Windowblinds skin for Koasati's Laz eOS series of skins. 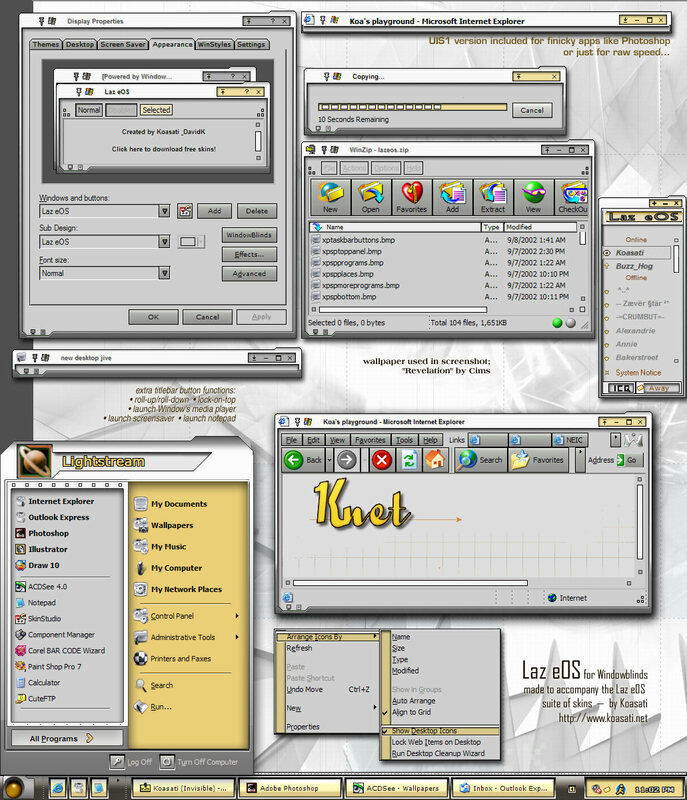 Features several extra titlebar functions and a matching UIS1 skin. very impressive. Clean, simple, and attractive. I like very much the white title bar and the combination of the colors you have use in this skin. Great! Wow, great work! Going straight on to my desktop. Thank you. Very professional looking skins, the metal efect is perfect and the schme is very pleasent to the eyes. You guys made a great work on this set. Thank you! When using ObjectBar it doesn't import the WinXp skin correctly. Otherwise I like it. Jason - I checked the Object Bar import and it actually works perfectly *except* for the stupid bug in their taskbar import. WB has two states for the taskbar graphic, one for each side of the screen. OB takes the whole graphic, both states, and treats it as a single piece. That gives you that ugly checkerboard effect on the taskbar. Stardock's WB team needs to explain to the OB team about taskbar states... don't they talk to each other? Very nice skin. Thanks for including a UIS1 version! I'm getting one small bug though. Using XP, on my start menu, it looks like some of the menu images are being scaled incorrectly. the center vertical bar is too far to the left, and it looks like it's trying to tile the name and user icon part of the menu. Otherwise, everything else is great. DavidK - I don't think I'm using the large fonts (I agree, very evil :o)). I'll have to check when I get home, just in case windows decided to do it for me. DavidK - No luck. Definitely not using large fonts, still shows the menu image issue. I'll post a shot on the windowblinds binary group, if you want to look at it. Anyway, even with the little issue, it's still an excellent skin, and I'm using it :o). This skin shines! I was love the small title bars and the colors. The start menu is cool, too! I have a special fondness for skins that make neat sounds... and I like the mouseover on the start button. Well, I like all the mouseovers. Thanks! ....but the fontwork in the title, ain�t to easy. Very slick skin. Keep them coming.